If you want to be a "partner" at a venture fund you need to dress for the job you want, not the job you have. 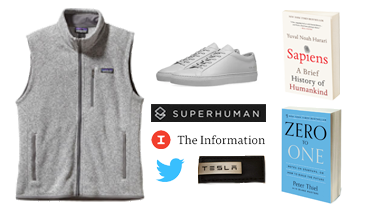 Every VC wardrobe needs a Patagonia Better Sweater Fleece. These sneakers are a staple of Silicon Valley attire. The company itself is valued at $1.4 billion. Signal your intellectualism by occasionally quoting Sapiens. You'll soon be able to work in "What important truth do very few people agree with you on?" into everyday conversation. We'll subscribe you to all of the important VC newsletters like Term Sheet, StrictlyVC, Stratechery, and Wine Spectator. 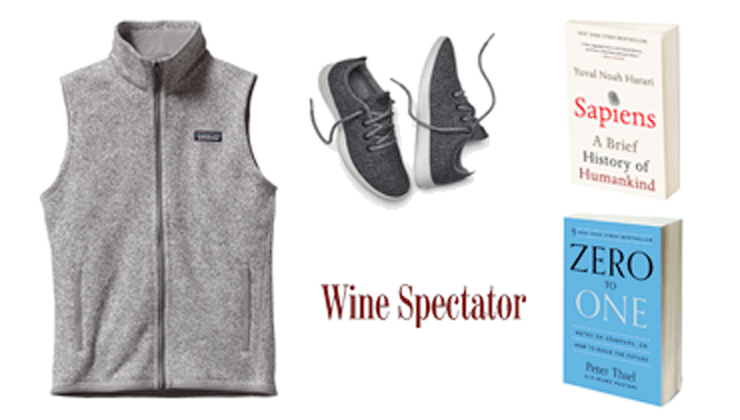 Nothing says SF VC casual like a Patagonia Better Sweater Vest paired with gray Allbirds runners. You'll fit right into Demo Day. A donation to All Raise will be made in your name. Put those management fees towards good use with the "Fund II" Kit. For every aspiring "Managing Director". Instead of Allbirds, you'll get these invite only sneakers, which come in quarter sizes and cost $180. VCs spend at least 3hrs/day in email. A one month credit to this invite-only email client will help you get to Inbox Zero. A one month credit for access to the "most thoughtful / smartest tech coverage" (according to Sam Altman). Are you really a VC if you don't tweet about your (current or future) Tesla? Mens Patagonia Better Sweater Vest, a personalized Twitter feed audit, Atoms sneakers, and a donation to All Raise made in your name. 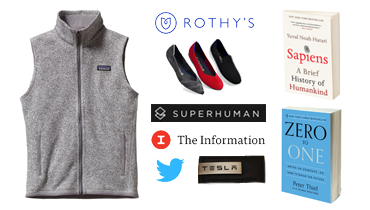 Womens Patagonia Better Sweater Vest, a personalized Twitter feed audit, Atoms sneakers, and a donation to All Raise made in your name. What do you get someone who already has a $1B+ fund? This exclusive collection of items will catapult you into peak-VC. Blood transfusions for anti-aging might not be FDA approved, but what are you supposed to do when the biggest hobby of elite VCs is to trying to live forever. Every GP of a $1B+ fund has an apocalypse plan, with many choosing to take a private jet to their farm in New Zealand. You aren't really an elite VC unless you own a $50M+ mansion in Atherthon or Woodside, CA. How much for this kit? Is this real? Is there a return policy? We believe in risk taking. So should you. What else are you going to spend your management fees on? 2 and 20 can only buy so many wine bottles. Besides like many venture backed businesses, profits aren't really the goal for us. The profits of this sale will go to All Raise, an organization dedicated to diversity in funders & founders. Sure. Let us know who the gift is for after you check out. Is VCStarterKit accepting term sheets? We may or may not be raising a $10M seed round at $50M pre. VCStarterPack is not affiliated with All Raise or any other organization/individual named or pictured on this site.